The Fellowship was fortunate enough to obtain a copy of MONSTRESS #1 from Image Comics. Marjorie Liu writes, Sana Takeda draws and colors, and Rus Wooton letters. Maika is driven to find the mask. She’s trying very hard to keep the memory of her mother but forget the horror of the battle that killed her. The mask is in the capitol of her greatest enemies, those who betrayed her mother. In the five years since the battle, she has learned a great deal, and sacrificed just as much. But she must find the mask, though she has no idea what it will do to her. This is a very densely woven story. It reads like poetry, and it manages to do that in a way that simply wouldn’t work without the art. The art is intertwined with the story to a degree that most creators can only dream of. It shows us a world where different people have done (and still do) terrible things to each other, all in the name of power. This is a very emotional story as well, and a powerful one. This book is so good on so many levels that I don’t feel that I can do it justice. This is not just a book to read – it’s an experience that you just have to see for yourself. 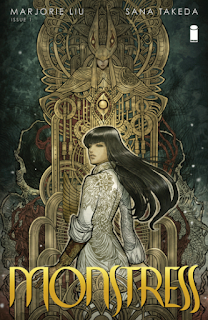 MONSTRESS #1 is available now at your FLCS or at imagecomics.com.